Mrs. AS and I went to Sol de Mexico on Saturday. It was packed, somewhat disorganized but the food was fantastic. Irine18 wrote: I'm coming out of lurker status to comment on this thread. I'm still recovering from Valentine's Day, which was more like Valentine's week than anything . . . Thanks, Irine, for the inside look. It's always nice to hear stories from the other side of the table -- especially from someone who loves what they do. A few friends of mine who are in the biz were mostly disappointed this year because of the Saturday holiday. What would have normally been an extra night of busy-ness during the week, got compressed into a Saturday, when their restaurants would have been busy anyway. To make things just a bit worse, instead of the larger groups that would typically come in on a Saturday, Valentine's Day is most 2-tops, so while all their tables were going to be occupied, they were expecting to do only about 60% of the covers they normally do on a Saturday. Funny how the luck of the draw can have such a profound effect on some businesses. Of course, it sounds like your restaurant was able to absorb the extra Saturday business without a hiccup. Must be good management! Help me out. Looking for something that is romantic, but not overly priced. Any options? What do you consider "not too expensive"? I mean, i can think of lots of things that are not expensive when compared to Alinea/Trotter's/etc. To throw out one random idea: Sweets and Savories on Fullerton. I've only been once, but we had a fantastic meal at a very reasonable price (prix fixe in the 30s somewhere, if i recall correctly), and others here sing its praises. BYO helps keep the cost down, and it's ever-so-slightly out of the way, so it's got an air of mystery to it. It's got white tablecloths, etc., so it in no way feels dive-y. They may be doing something special for V-day - i'll leave that to you to investigate. I think a private booth at GRN Sabatino's would be a great option. Depending on who you reach and for when you are making your reservations, they might offer to reserve a private booth for you, or, more likely for a high volume evening like Valentine's, they will just give you a general reservation and once you arrive, you may have to wait a little bit for a private booth. There are only a small number of the alcoves/booths, so they are in high demand. But, when you wait, you can always relax at the bar and enjoy some piano music. Not the worst way to spend 30-45 minutes. Beware of places that have special menus on Valentine's Day, with "special" prices. Valentine's '09 - where to blow $200?? A heart-shaped deep-dish pizza from Malnati's is a sentimental favorite for us. With Valentine's Day falling on a Sunday this year, brunch could be a good option (but obviously only at a place that takes reservations). We're going to Nightwood. Thank you everyone. Great responses. My lady friend does enjoy ethnic places, and I love BYOB for the cost cutting. I would like to stay in the city limits. I am in Lakeview, and she is in Lincoln Park, so I was hoping somewhere within that region. I was looking to keep the meal under like $125 total. A few years ago, my friend Jason who lives in NJ, chronicled his Valentines Day meal at White Castle . . .
Gotta love the printed menus and the flowers on the tables. On the topic of heart-shaped pizzas, I'd like to mention that Buffo's in Highwood also offers a thin crust version. I've always liked their thin crust (disclaimer: I worked there for a few summers during my college years) and while everything is good, their barbeque chicken is definitely something to try. The sauce is more smoky than sweet and the chicken is grilled and diced fresh for each pizza. grace21 wrote: On the topic of heart-shaped pizzas, I'd like to mention that Buffo's in Highwood also offers a thin crust version. I've always liked their thin crust (disclaimer: I worked there for a few summers during my college years) and while everything is good, their barbeque chicken is definitely something to try. The sauce is more smoky than sweet and the chicken is grilled and diced fresh for each pizza. Barnaby's Northbrook used to offer heart shaped pizza on V-day...since very little there changes from decade to decade, I'd guess they still do but if you're so inclined, best to call first and verify. I love to cook and nest at home for holidays where people traditionally go out (New Years Eve), but I also like to take my S-E-X (Spousal-Equivalent-eXtaordinaire) out and treat her to a lovely time. Dining out on VD is rolling the dice when it comes to service, that is why the perfect "dining" experience is Afternoon Tea at The Peninsula. Unparalleled service in a warm soothing atmosphere with live music, sipping tea and noshing on plates of mini sandwiches and pastries. Stroll Boule Mich before or after or take a carriage ride to The Peninsula. It is more memorable than any traditional meal ever will be. i would recommend spiaggia. it's really good. get the tasting menu and relax for the evening. last time i was there i had some sort of pasta that tasted like the best penne ala vodka i'd ever had. i know that sounds crazy, but for real, it was rad. "cooking is an art. baking a science." G Wiv wrote: For the second year in a row Marie's was the perfect place to spend Valentine's day. Third year in a row, the perfect place to celebrate Valentines day with bride and friends. Highly recommended. i spent my v-day in des plaines,il at the winter burn off bbq contest . it was a great day ,sunny & the smell of(wood smoke ) 17 cookteams in the air. took 10th overall & got a call in pork 4th place. had alot of fun. Sorry about the small image size, I can't figure out how to make it any larger. My sister-in-law made a reservation over a month ago. We call Barnaby's the recession special for dinner. 10 of us with tons of leftovers for $70. You cant beat that. Also enjoyed a heart-shaped pizza at Marie's last night (1/2 bacon and spinach, 1/2 cheese) - like all of our previous meals there, it was GREAT. The beginning of a Valentine's Day tradition for the fiance and myself! Next year I'll keep my eyes peeled for others enjoying this tradition . 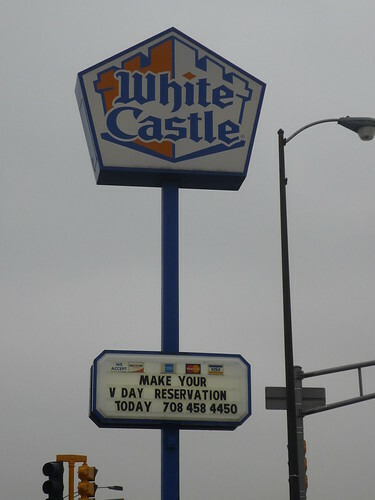 . .
For the 16th year, White Castle will turn hundreds of restaurants into love dens. Instead of spending hundreds of dollars on a night you'll likely forget in a week, go to White Castle and be seated by a well-dressed hostess at a table, complete with candlelight and tablecloth. At this point, you can feel free to stuff your faces. Even better, you could stuff each others. I just signed up for my first opentable.com reservation at White Castle for Valentine's Day. "Thanks for Valentine-ing at the Castle! (Yes, we made up that word. Just go with it.) If your reservation changes, please let us know. We look forward to creating life-lasting, slider-filled memories together." That sounds like the saddest Valentine's Day EVER. Fortunately, I look at it as good fun. We giggled through our dinner last year. Sometimes it was due to watching people looking shocked and others really digging it. The Moms and I really dig the experience, so we will be happy as clams. it feels like there should be something festive for valentine's dinner that is not the heavy red meat most food mags feature ...but borscht isn't quite it either. red sauce? what are you cooking?